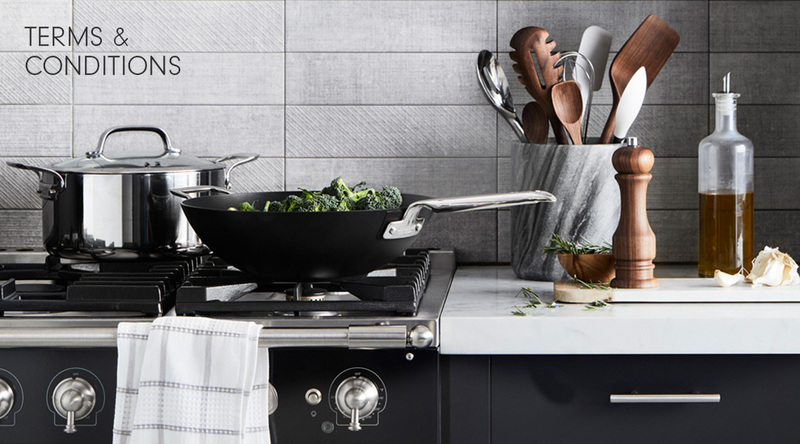 Welcome to www.williams–sonoma.me. This page tells you information about us and the legal terms and conditions ("Terms & Conditions") relating to this website. www.williams–sonoma.me is operated by M.H. Alshaya Co W.L.L. a company registered in Kuwait, under company number 2070 with its registered office at P.O. Box 181, Safat 13002, Kuwait. For the purposes of these Terms & Conditions, the terms Williams Sonoma, "we" and "us" refer to M.H. Alshaya Co W.L.L. These Terms & Conditions apply to your use of the Williams Sonoma website at www.williams–sonoma.me ("our website"). Please read these Terms & Conditions carefully as by accessing, browsing, using or registering on our website, you confirm that you have read, understood and agree to these Terms & Conditions in their entirety. We also suggest that you print and keep a copy for your future reference (but please check this page regularly to determine whether our Terms & Conditions have been updated – any new terms will automatically be effective when they are published on this website). Williams Sonoma grants you a limited licence to access and make personal use of this website, but not to download (other than page caching) or modify it, or any portion of it. If you are under 18, you may use www.williams–sonoma.me only with the involvement of a parent or guardian. We use reasonable efforts to ensure that our website is free from viruses and other malicious or harmful content. However, we cannot guarantee that your use of this website (including any content on it or any website accessible from it) will not cause damage to your computer or other device. It is your responsibility to ensure that you have the right equipment (including antivirus software) to use this website safely. Except where required by applicable law, Williams Sonoma shall not be liable to any person for any loss or damage they suffer as a result of viruses or other malicious or harmful content that they access from or via our website. If you register on our website, you are responsible for maintaining the confidentiality of your account and password and for restricting access to your computer to prevent unauthorised access to your account. Williams Sonoma will not be liable to any person for any loss or damage which may arise as a result of any failure by you to protect your password or account. you will notify us immediately of any changes to your personal information or if you have any reason to believe that your password is being used in an unauthorised manner by contacting our customer service representatives by e–mail, or calling us on (+965) 2224 2000. Although we will take all reasonable care to ensure that all details, descriptions and prices of Products appearing on our website are as up–to–date as possible, the information appearing on the website at any particular time may not always reflect the most up–to–date position. To the extent permitted by applicable law, Williams Sonoma disclaims all representations and warranties, express or implied, that content or information displayed in or on this website is accurate, complete, up–to–date and/or does not infringe the rights of any third party. Your privacy and security is important to us. We aim to ensure that any personal information you provide will always be held, used and transmitted securely. By using our website and/or registering with www.williams–sonoma.me, you are accepting and consenting to the practices described on this page. When you register on our website, we collect certain personal information from you, such as your name, address, telephone number, email address etc ("Personal Data"). We hold all such Personal Data on secure servers and treat it as fully confidential. We will retain your Personal Data for as long as it is legally required, and to support the business purposes for which it was obtained — we will then dispose of it promptly and securely. If you take the opportunity to 'share' www.westelm.me content with friends through social networks (such as Facebook and Twitter) you may be sent cookies from these websites. We don't control the setting of these cookies, so please check the third party websites for more information about their cookies and how to manage them. All copyright, trademarks and other intellectual property rights in all material, content or software supplied as part of our website shall remain at all times vested in us or our licensors and is protected by international copyright and database right laws. You are permitted to use this material only as expressly authorised by us or our licensors. You may not extract and/or utilise the whole or any part the website without our express written consent. Williams Sonoma and other marks indicated on our website are trademarks or registered trademarks of Williams–Sonoma, Inc. ("WSI") in the European Union, USA, UAE, Bahrain, Oman, Jordan, Qatar, Saudi Arabia, Lebanon, Kuwait, Egypt, Morocco, Russia and/or other jurisdictions. Williams Sonoma's graphics, logos, page headers, button icons, scripts and service names are the trademarks of WSI. These trademarks may not be used in connection with any product or service that is not Williams Sonoma's or WSI's, in any manner that is likely to cause confusion among customers, or in any manner that disparages or discredits Williams Sonoma or WSI. All other trademarks not owned by WSI that appear on this website are the property of their respective owners, who may or may not be affiliated with, connected to, or sponsored by Williams Sonoma or WSI. While we will use reasonable endeavours to verify the accuracy of any information we place on our website, we make no warranties, whether express or implied in relation to its accuracy or in relation to any transaction that may be conducted on or through the website (including but not limited to, implied warranties of non–infringement, compatibility, security, accuracy, conditions of completeness, or any implied warranty arising from course of dealing or usage or trade). We make no warranty that our website will meet your requirements or will be uninterrupted, timely or error–free, that defects will be corrected, or that the site or the server that makes it available are free of viruses or bugs or represents the full functionality, accuracy or reliability of the website. We will not be responsible or liable to you for any loss of content or material uploaded or transmitted through the website. any special or indirect losses suffered or incurred by that party arising out of or in connection with the provisions of any matter under these Terms &Conditions. These Terms & Conditions apply from 1 November 2012 for all use of the website after this date. We may occasionally amend these Terms & Conditions to reflect regulatory requirements and changes in our information collection and disclosure practices. Any new terms will automatically be effective when it is published on the website. We therefore suggest that you return here regularly to view our most up to date Terms & Conditions. Only you and Williams Sonoma shall be entitled to enforce these Terms & Conditions. No third party shall be entitled to enforce any of these Terms & Conditions. You may not assign or sub–contract any of your rights or obligations under these Terms & Conditions to any third party unless we agree in writing. We may assign, transfer or sub–contract any of our rights or obligations under these Terms & Conditions to any third party at our discretion. We may use your contact details to send you further information on Williams Sonoma products, to keep you up–to–date on goods, services, new collections and promotional offers you may be interested in and for research purposes.